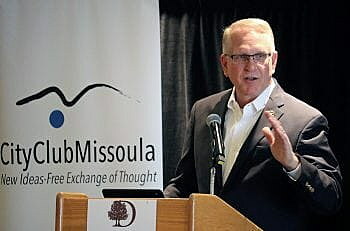 With funding set to expire this year, Montana Attorney General Tim Fox urged Congress to reauthorize the Violence Against Women Act, saying it has been effective in reducing rates of sexual and partner violence. Fox joined attorneys general from 55 other U.S states and territories in signing a letter to leaders of the House Judiciary Committee on Tuesday. Allowing the act to expire, Fox said, would mark a significant step backward in addressing crimes against women. The act was established in 1994 and has brought more than $6 billion in grant funding to government and nonprofit organizations nationwide. Fox said Montana has received more than $73 million since 2005. The grants have funded training and assistance to address and reduce domestic violence, dating violence, sexual assault and stalking. Fox said the grants provided through the program have also funded resources and services to assist survivors and prosecute offenders. It also has facilitated partnerships between prosecutors, judges, advocates, community organizations and health care providers.